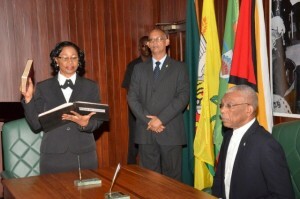 Justice Yonette Cummings-Edwards, Chief Justice (Ag) takes her Oath as a Member of the Judicial Service Commission, before His Excellency, President David Granger, at the Ministry of the Presidency Wednesday morning. There is nothing unusual about a retiring Chief Justice or any judge making decisions during their pre-retirement leave in cases that would have been heard before them in the Courts. This is according to statements made by sitting Chief Justice (ag) Yonnette Cummings-Edwards who explained that the practice has been employed by Judges in the past. The comments come after Attorney General Basil Williams had raised strenuous concerns over recent rulings delivered by now retired Chief Justice Ian Chang. Williams, who has since challenged the ruling has indicated that one of his grounds in the challenge is the fact that Chang came out of pre-retirement to deliver the ruling. Williams also charged that the former Chief Justice did not afford him an opportunity to respond. “Acting Chief Justice Chang had not demitted office…he was on leave and those matters were part heard before him and those – the decisions were pending in those matters,” said Cummings on Wednesday. She said that there have been few other cases were rulings were delivered in similar a similar manner. “He chose to come and give the decision rather than have the matter done over…there have been cases before where judges as far as I can recall came out,” said the Chief Justice. She stated too that the legislation is “silent” on whether it is legally wrong for rulings to be given in such a manner.